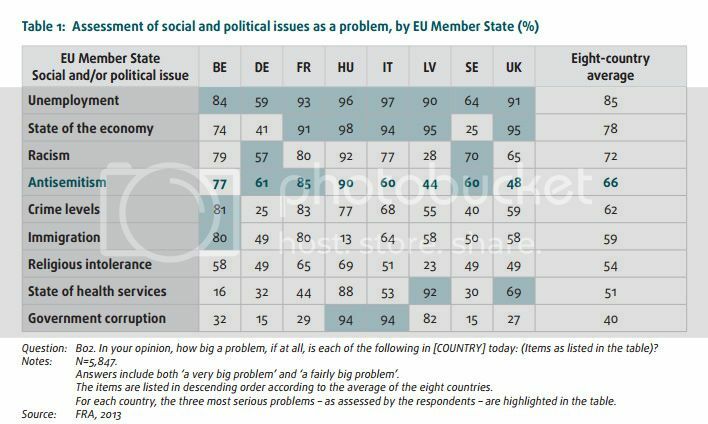 Despite a number of legal instruments that offer protection against racism and related forms of intolerance, ethnic and religious minorities across the EU continue to face racism, discrimination, verbal and physical violence, and exclusion. 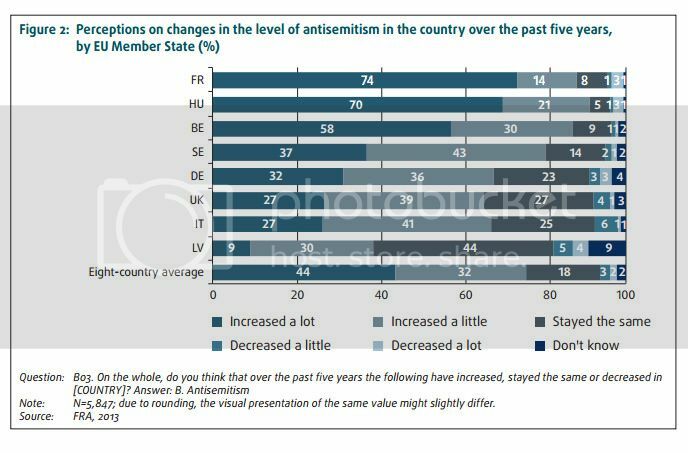 A poll of 6,000 Jewish people in eight EU member states finds three-quarters say problem has escalated in last five years. 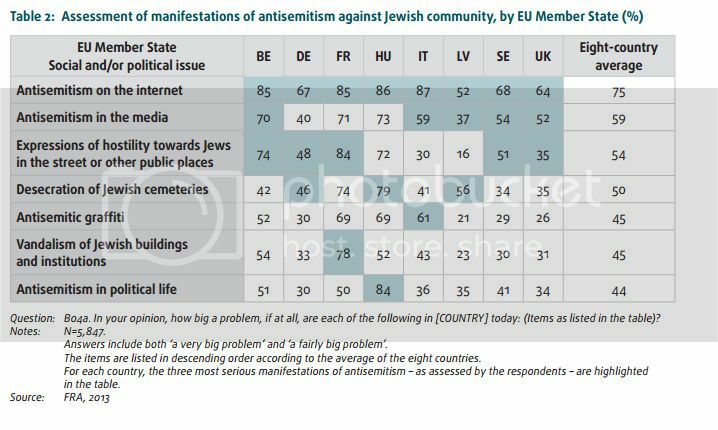 A survey of discrimination and hate crimes against Jewish people in Europe, released to mark the 75th anniversary of Kristallnacht, suggests that antisemitism is on the rise, with three-quarters of those polled reporting an increase over the last five years and growing fears over online abuse and hate speech. Jews are migrating to Israel in record numbers. They feel the compulsion to hide their religion/ethnicity in public, primarily in France. What's happening? 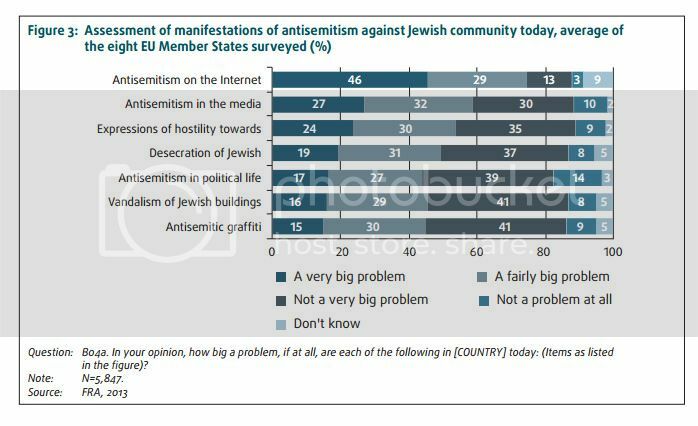 Yes, it seems that anti-Semitism is on rise. Malmö in Sweden has a rather large amount of Jewa. In the 70iets there were around 2000 and a couple of years ago just 500. 17% of the population in Malmö comes from Asia, Africa and East Europe. Certain areas in Malmö has a strong crimilaty. 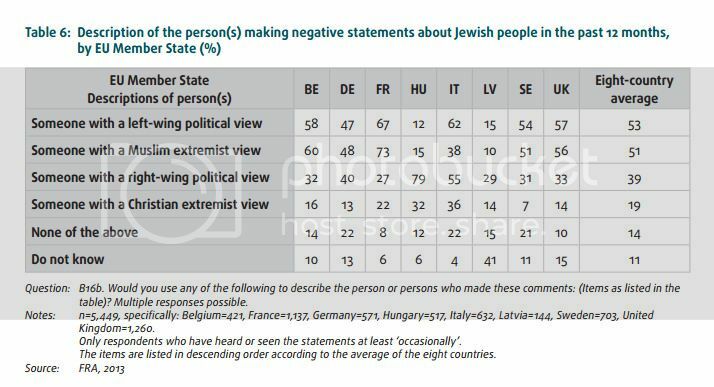 Swedes as a rule are not really anti Semitic. I ought to be PC as much as possible so I will not mention any names or groups which attacks Jews in Malmö. This article shows some other numbers than I found and is also less PC than I was. The right-wing conservatives and extreme right-wing groups are getting more and more support. Open support. And that's leading to the fact that the very extreme right-wingers are coming out of the closet. (The AfD [Alternative for Germany] now has about 10% support in the population and some spokespersons, who talk like Nazis in the 1930's. Last year, nearly 8,000 out of the 500,000 French Jews immigrated to Israel, and 900 from the UK. 10,000 European Jews immigrated last year (third and forth largest number are those from Italy and Belgium). In Sweden it is the party Sverige Demokraterna which is right winged and they have 20%. How come that the Swedes who really always like to be neutral and are afraid of conflicts vote for this party? Probably just because they are neutral and afraid of conflicts. We have for a long time not been allowed to mention anything bad about non EU citizens. Criminality amongst refugees were at the police registrated under number 291 and kept secret and newpapers and media never mentioned anything bad. SD started to do so and was right away called racists and nazists. In inland born Swedes, abroad born people and in inland born Swedes with parents born abroad. I am a Swede born in inland by parents born abroad. They were Danes and do I now get put into the same pot as some from tulahula land? Probably not as it is EU. At the moment the Danish media is so against Sweden it is really sad. Luckily more and more non SD supporters do start to talk openly about the problems in Sweden. The belong to the European Alliance for Freedom like the Vlaams Belang, Le Pen's National Front, the Freedom Party of Austria ... ... ... all with a very high support in their respective countries. This is so distressing, and calling it distressing seems like such an inadequate response. I'm at a loss. 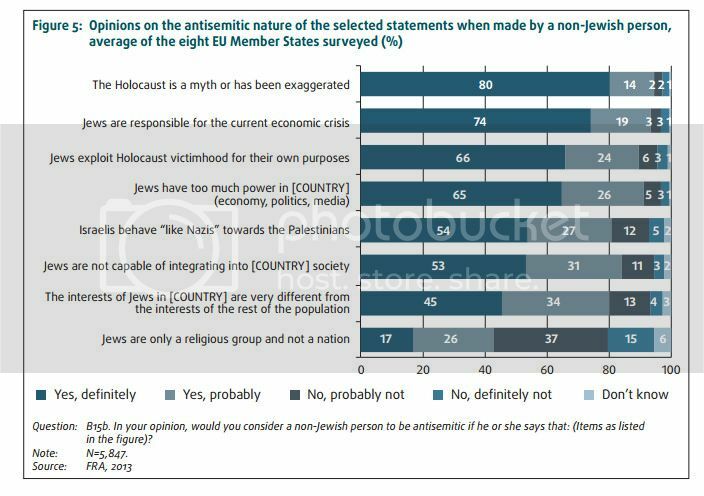 Europe has a long and brutal history of antisemitism. This is not to exculpate other nations. In the United States, antisemitism is alive and well. In the United States, the Bill of Rights and the Fourteenth amendment have been used effectively to mitigate the effect. Walter will know if similar situations exist in Europe. I was appalled in the late 1990s to have some clown start telling me about The Protocols of the Elders of Zion. Religious bigotry and conspiracy theories will always be popular. Why is there no mention of Muslim immigrants? Aren't some of them anti-Semitic? I will edit my comment: The government of Hungary has had a very restricted policy against immigration to their country; so, I supposed there aren't a large number of Muslim immigrants residing in that country. 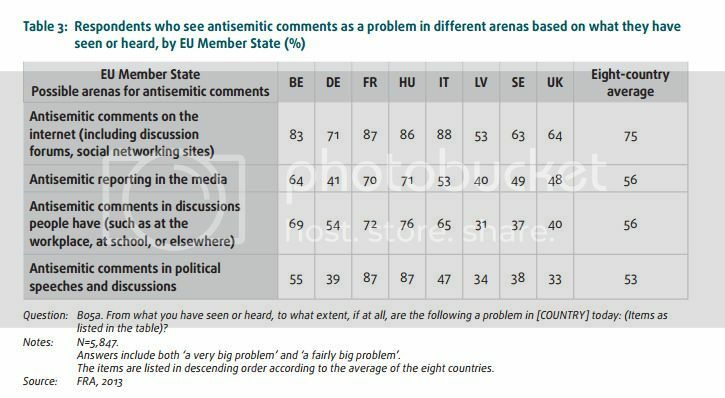 But there still has been a resurgence of antisemitism. 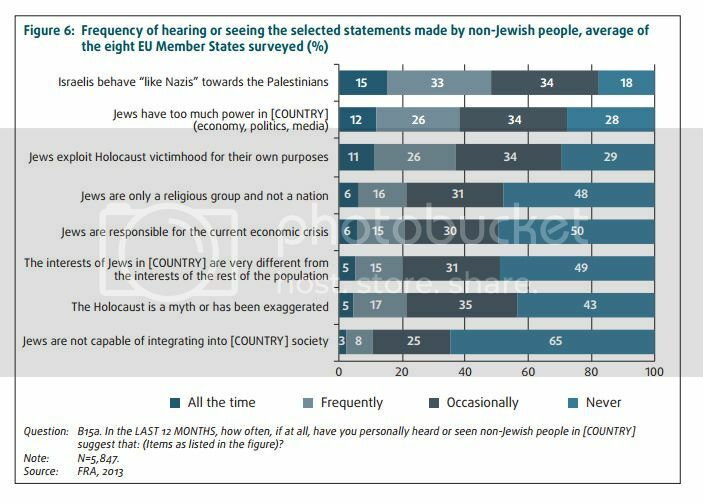 Quite sadly, anti-Semitic prejudice has continued to exist decades after the Holocaust. One would think that people would learn from their country's history, especially in recent times. But some of them don't learn, apparently. No expert on all this, I have taken it for many years that Muslims are also (by and large) semitic. I'm not clear if that is basically somehow about genetics originally, I imagine not completely: someone else here will know. Like many groups and religions and non religious, people can get very angry with each other, or, alternatively, sometimes peaceful. Yes, Jews and Arabs (a category that includes non-Muslims as well as Muslims, of course) are Semites. Both groups are descended from Abraham. 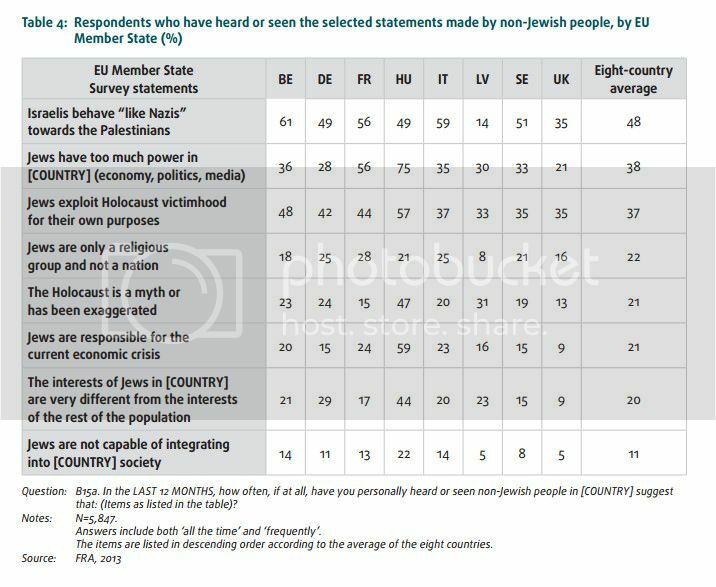 Quite obviously, the Palestinian issue has resulted in a lot of hatred between Muslims and Jews. Yes, but why then ask if muslims are anti semitic? I would gather that muslims vary like the rest of us, busy as I am in the middle of a book by Orhan Pamuk, Snow. I'm learning a lot reading it. Am in a rest phase, too much learning at once makes me want to make a bundt cake.